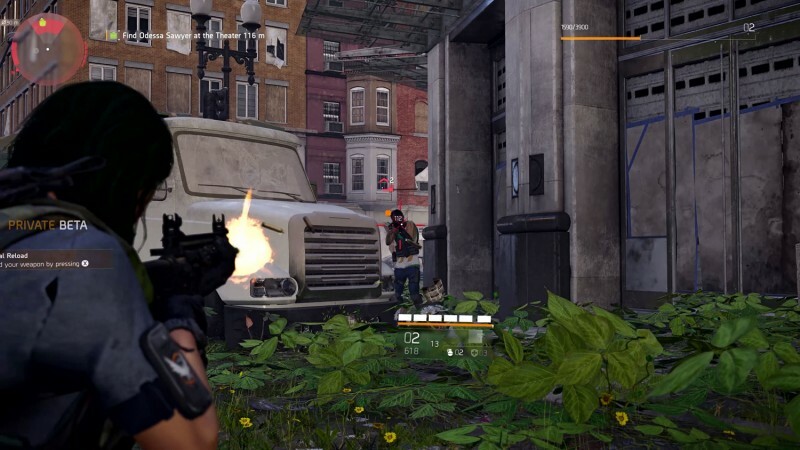 Last week, we got to spend several hours with the Division 2. During that time, we explored the ruined streets of Washington, D.C., cleared a few side missions, helped some settlements, and skipped ahead to check out one of the endgame missions. There was a lot to absorb, but here are our 10 biggest takeaways. Our day began with a memorable mission: Our Division agent stormed the White House, which was under siege. After eliminating the threat, we moved into the building, which has been transformed into the Division’s base of operations. Folding tables and supply crates lined the hallways of the building, which made for a jarring scene. “It just felt natural,” says creative director Julian Gerighty. “If you’ve ever been to the White House, it’s actually fairly small-scale. It feels like it could be a base of operations. So where better to lead the rebuilding of the city and the country than the White House? 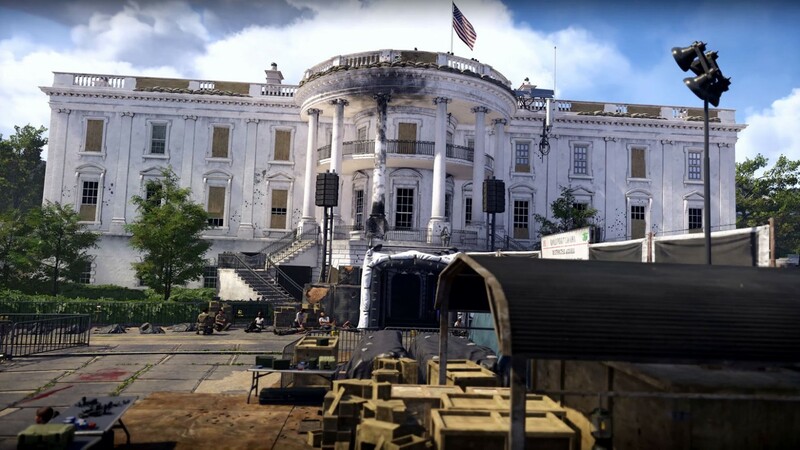 For me, it’s an obvious thing.” New York’s post office HQ was an important hub in the first game, but it’s hard to beat the symbolism attached to the White House. Not only can the civilian NPC take care of themselves, they can help you out, too. 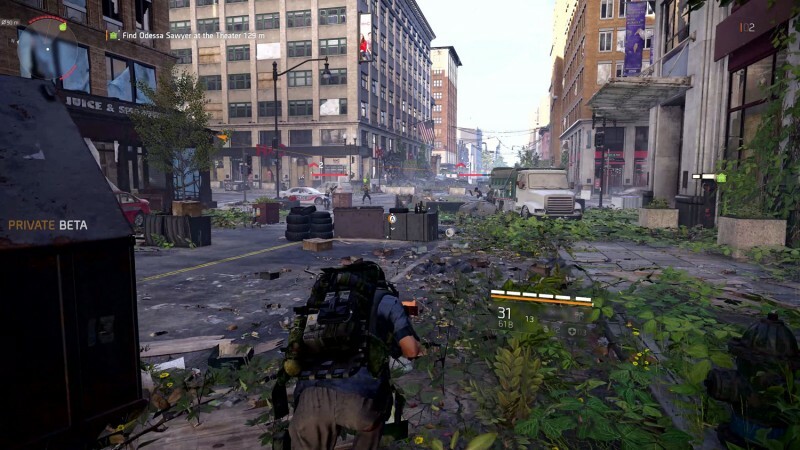 Certain sections of the city can be taken over by enemy factions, and players have to reclaim them if they want to maintain order. 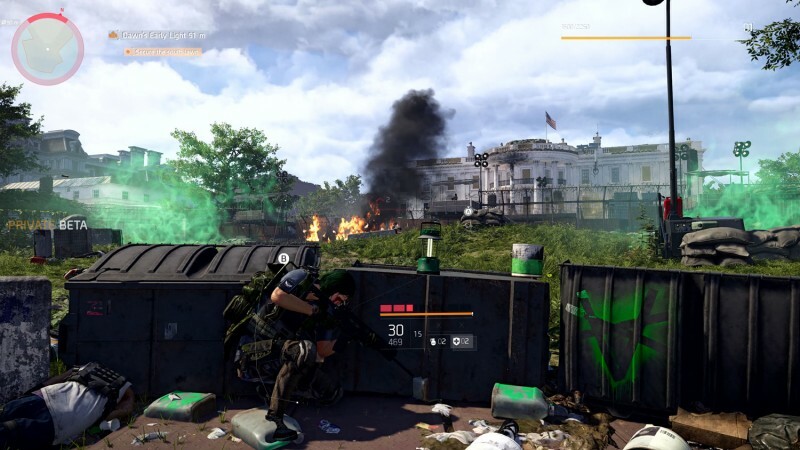 “You can get into the area and scout it out, and then shoot this flare to call in reinforcements before you attack, and civilians will come,” says senior lead designer Keith Evans. “Unlike a lot of our NPCs from the first game, they’ll actually help you fight. They really can help swing the battle.” After you’ve reclaimed the area, you can donate supplies and perform other tasks to keep the friendly civilians in power. After all, the stronger they are, the better they’re able to battle enemy factions and hold territory on their own. D.C.’s weather is a lot more dynamic than New York City in the wintertime – or at least it is in The Division. “We wanted to have something that we could play around with a little bit more,” Gerighty says. “So you have thunderstorms. You have thick, pea-soup style fog in the evenings and in the mornings. You’ve got rain. There’s a lot more variety in the types of weather and times of day that you can get within this setting.” We did have a small skirmish in the streets during one especially foggy period, and it completely changed the sensation of battle. Without clear sightlines, we had to move from cover to cover more cautiously, since I didn’t know where my enemies were. They weren’t granted superhuman sight, fortunately, which could have been frustrating. Not only was it visually impressive, but it changed what would have been a fairly ordinary encounter. When we said nature was reclaiming D.C., we weren’t kidding. The city is teeming with animal life, including deer, rats, dogs, and more. While you can shoot each of these animals, don’t expect any rewards for your efforts. “We have a deep crafting system that’s much deeper than the first game,” Evans says. “But we wanted to tie that more into scavenging. There’s not a hunting aspect to the game, but that’s there to… you’ll notice that the animals in D.C. are totally different from the animals that were in New York. We wanted to tie that into selling the believability of the space. You’ll find foxes or raccoons that duck under cars if you get close to them, and there’s even vultures that will attack other animals or bald eagles that are rare in that area of the country.” In other words, you won’t be using pelts to make ammo pouches, or anything weird like that.